Sidmouth Festival (full weeks 1997, 1999, 2003, 2007, 2013, plus special appearances); The Big Chill (2006); Ely Folk Festival (2017), Chippenham Folk Festival (1999, 2009, 2016); Towersey Village Festival (2000, 2007, 2013); Warwick Folk Festival (2001, 2004, 2007, 2014); Whitby Folk Week (2002); Cheltenham Folk Festival (2009); Banbury Hobby Horse Festival (2000 – 2003, 2016); Cleethorpes Folk Festival (2002); Weymouth Folk Festival (2004); Wimborne Folk Festival (2005); Two Rivers Festival, Chepstow (2008); Banbury Canalside Folk Festival (2008); Wallingford Bunkfest (2006, 2008, 2010, 2015); Beverley Folk Festival (2010); Priddy Folk Festival (2013, 2014, 2016). Frost and Fire, main stage, Sidmouth International Festival (1996): a celebration of the English ritual year, featuring Martin Carthy, Norma Waterson, Eliza Carthy, Saul Rose, Sandra and Nancy Kerr and The Chipolatas. Flashback, main stage, Sidmouth International Festival (1999): celebrating the centenary of the meeting in Oxford that led to the revival of morris dancing. Morris On concerts with Ashley Hutchings, including Sidmouth International Festival (2002), Rochester Cathedral (2003), The Swan Theatre at Worcester and Cropredy Festival (2004), Cromer pier theatre (2005), and the Roses Theatre in Tewkesbury, Saul Boat Festival and Oxford and Salisbury Folk Festivals (2006). At Cropredy we danced for an estimated audience of 18,000. 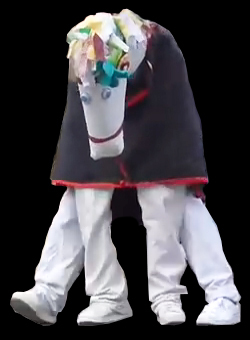 The Big Caper, an hour-long celebration of contemporary Cotswold morris, created by The Crew and Berkshire Bedlam Morris. First presented in the town hall theatre in De Panne in Belgium and at Wallingford Bunkfest (2006) and since performed at several UK and overseas festivals.